The criminologists Sykes and Matza developed a conceptual framework for explaining and understanding juvenile delinquency. They challenged the virtue ethical assumption that criminals are primarily morally deviant individuals and instead suggested that crimes can be the result of processes in which individuals with ordinary moral beliefs and convictions were able to convince themselves that their actions are morally acceptable. 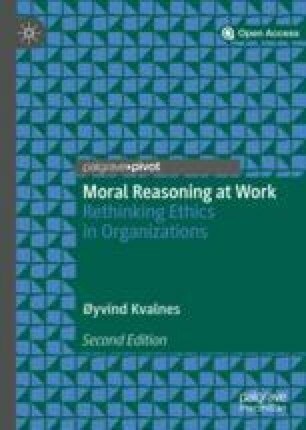 This chapter adopts a similar approach to moral wrongdoing in organizations and explains how it can be a process in which initial moral dissonance gives way to acceptance through a process of moral neutralization. Sykes and Matza defined five techniques juvenile delinquents applied to overcome the queasiness of acting against their moral convictions: denial of responsibility, denial of injury, denial of victim, condemnation of condemners, and appeal to higher loyalty. All these techniques can be employed in workplaces where people experience dissonance between their moral beliefs and what they are tempted or ordered to do. A significant dimension of ethics in organizations is being alert to neutralization attempts and being ready to challenge and question them. Heath goes on to argue that business and organizational ethics can learn from criminology in trying to understand the reasoning and motivation of people who have been involved in wrongdoing. Moral dissonance: The alternative under consideration conflicts with the decision-maker’s moral beliefs and convictions. Moral neutralization: The decision-maker seeks release from moral dissonance by challenging the initial conflict between the general moral beliefs and the present alternative by finding excuses and justifications that place the decision in a more harmonious light. Normalization of questionable behavior: Once the decision-maker has neutralized the moral dissonance and chosen the alternative that caused it, a new pathway for dealing with such situations can be put in place and set the context for further misbehavior. I previously applied the three-step model in a study of customer behavior in insurance (Kvalnes, 2011), an investigation of leader behaviors in reference situations (Kvalnes, 2014b), a study of moral fallibility (Kvalnes, 2017), a conceptual account of honesty issues in projects (Kvalnes, 2014a), and with Nordal in work on the causes of the financial crisis in Iceland (Kvalnes & Nordal, 2018). In the current chapter, I build on and develop the conceptual groundwork from those studies. The three-step pattern can occur in a range of settings. In business contexts, it occurs among suppliers and their individual and organizational customers. Some of the most celebrated and valued products of this era depend on production methods that initially create moral dissonance. Cobalt used in smartphones’ and electric vehicles’ lithium batteries is mined under socially and environmentally hazardous conditions in the Democratic Republic of the Congo and other countries (Frankel, 2016; Sadof, Mucha, & Frankel, 2018). Child and adult miners entering the cobalt mines are exposed to extreme working conditions that pose a serious threat to their health and security. The pollution of the local environment is also considerable. These facts can create moral dissonance among suppliers and customers, but people skillfully maneuver out of that condition by finding excuses that neutralize their discomfort, thus paving the way for the normalization of questionable behavior. Normalization of questionable behavior is a concept derived from Donaldson’s study (2012) of the root causes of the 2008 financial crisis. He likens it to the phenomenon of normalization of danger, in which people who live with and experience dangerous conditions gradually come to see them as a part of their everyday environment and cease to be bothered by them (Donaldson, 2012). In the financial crisis context, he states that “bad practices can become institutionalized, and initial queasiness gives way to industry-wide acceptance” (Donaldson, 2012, p. 6). “Queasiness” in this quote is equivalent to what I call moral dissonance. Sykes and Matza (1957) introduced the concept of neutralization in connection with studies of juvenile delinquency. They interviewed young criminals to map and investigate their moral reasoning. Through this process, they identified five categories of techniques offenders use to neutralize and deny their actions’ wrongness: denial of responsibility, denial of injury, denial of victim, condemnation of condemners, and appeal to higher loyalties. I will present them in more detail below. A person can face a situation in which he or she is either tempted or ordered to act in a way that conflicts with his or her moral convictions and therefore experience moral dissonance. The concept of moral neutralization depicts the cognitive process of convincing oneself that choosing that alternative is morally acceptable after all. It has been adapted in a range of research contexts, in studies of justifications of tax evasion (Thurman, John, & Riggs, 1984), normalization of corruption (Ashforth & Anand, 2003), insurance customer dishonesty (Brinkmann, 2005), software piracy (Bhal & Leekha, 2008; Siponen, Vance, & Willison, 2012), consumption of counterfeit luxury goods (Bian, Wang, Smith, & Yannopoulou, 2016), misconduct in marketing (Vitell & Grove, 1987), and unethical behavior intended to benefit one’s own organization (Umphress, Bingham, & Mitchell, 2010). The basic assumption about moral neutralization in the tradition after Sykes and Matza is that “people do not ordinarily engage in reprehensible conduct until they have justified to themselves the rightness of their actions” (Bandura, Barbaranelli, Caprara, & Pastorelli, 1996, p. 365). Moral dissonance occurs when a conflict arises between a particular course of action and the decision-maker’s moral convictions. In music, dissonance is the simultaneous emission of two or more disharmonious sounds. The general term of cognitive dissonance applies to the discomfort of holding conflicting cognitions. Festinger, Riecken, and Schachter (1956) introduced it in their exploration of the cognitive struggles of a UFO cult whose members believed in an impending apocalypse and had to take in a reality in which it did not happen. Their general apocalyptic belief did not match their perceptions of what actually took place in the world. A morally conscientious athlete faces an opportunity to use illegal drugs to improve performances. Her coach recommends that she take it. Should she do it? Socially and environmentally conscious parents hear from their daughter that she is now alone among her friends in not having a smartphone, a product based on dubious cobalt production in the Democratic Republic of the Congo. Should they buy one for her? Your favorite social media platform has been exposed as sharing user data with third parties, making it possible to manipulate information for political and marketing purposes. Should you ignore this information and continue to use it? You have agreed to be the reference person for a quarrelsome colleague who has applied for a job elsewhere. Your boss has instructed you to keep quiet and if necessary lie about the employee’s social abilities to increase the chances that the colleague disappears from your organization. Should you obey? The board of a football club can bolster the ambitious plans to win competitions and titles by accepting an offer of a fresh influx of cash from powerful and wealthy people based in a country with a poor human rights record. Should they accept it? Executives at a bank see that they are lagging behind competitors because of a reluctance to use more aggressive sales methods designed to exploit the customers’ limited understanding of financial affairs and consider a change in practice in the direction of what the competitors are doing. Would that be appropriate? A car manufacturer has ambitions to enter the American market with a new car equipped with a diesel engine. Leaders in the company are concerned that the engine will not meet the strict emission standards and order their engineers to find a solution. A group of engineers comes up with a plan to design an engine that will meet the emission standards during laboratory testing but create 40 times more pollution during real-world driving. Should they pursue that alternative? In these examples, the decision-makers are likely to experience moral discomfort or dissonance at the thought of pursuing the alternative and acting against their own moral convictions. They also fit under the description of false dilemmas, discussed earlier in this book. If the decision-makers are guided by their moral convictions in responding to these alternatives, what they ought to do is clear. However, aspects of the situation encourage them to act against those convictions. Moral dissonance occurs in the absence of what Rawls (1971) calls reflective equilibrium. His assumption is that, when people make moral judgments about a particular issue, they compare actions to a general standard of what is morally right and wrong in such situations. People seek coherence between moral beliefs about a particular situation and general moral beliefs about how to behave in such situations. The principle of equality guides reflections of this kind as people try to achieve internal balance and equilibrium. When a breakdown occurs in this attempt to reconcile the particular and the general, people experience moral dissonance. Temptation to act in ways that conflict with one’s moral convictions generates moral dissonance. However, moral dissonance can occur without temptation, as in one of the examples above in which a superior instructed an employee to lie in a reference conversation. Participants in Milgram’s experiment on obedience to authority experienced an intense moral discomfort in obeying orders to inflict pain on another human being (Milgram 1963). They, too, faced moral dissonance, a clash between their moral convictions and the moral aspect of what they were ordered to do. Similarly, in business settings, employees can receive orders from their superiors to engage in sales and marketing practices that go against what they consider morally acceptable. The moral saint: A person who hardly ever acts immorally and frequently goes beyond moral expectations to be of service to others. The moral cynic: A person who regularly shows a disregard for moral considerations in the pursuit of his or her goals and shows minimal concern for other people’s well-being. The moral doubter: A person who strives to live in accordance with his moral beliefs and convictions but can experience temptations to do otherwise. Wolf (1982) has highlighted the problematic aspects of being a moral saint, in which being supremely moral is the main life project and overshadows all other projects. Moral saints seem to belittle the activities that others enjoy simply for the sake of doing them, although they do not contribute to others’ well-being. Neither the consistent moral saint nor the consistent moral cynic are bothered much by moral dissonance—the former because the morally wrong alternatives seldom or never occur as real options, and the latter because he or she lacks qualms about acting in opposition to ordinary moral considerations. The moral doubter is primarily genuinely uncertain about whether to act against his or her own moral convictions and can experience moral dissonance. When people experience moral dissonance, the two main options available are to side with moral convictions (and thus to dismiss the alternative that causes the dissonance) and to attempt to neutralize the discomfort. When people choose the latter, their moral reasoning can follow the pattern outlined in the five neutralization techniques that Sykes and Matza (1957) identified. The decision-maker claims that one or more of the conditions for responsible agency are absent. Forces beyond his or her control rule out genuine decision-making and the freedom to choose. The decision-maker sees himself or herself as “helplessly propelled into new situations” and “more acted upon than acting” (Sykes & Matza, 1957, p. 667). In business, this technique can take the expression of the person presenting himself as a pawn on a chess board, moved around by his or her superiors. The truly responsible people are making the decisions. When employees in a Norwegian waste management company were confronted with the fact that they had allowed industry clients to dump hazardous waste in nature, one of their responses was that they had simply been following orders from their superiors and therefore were not responsible (Kvalnes, 2017; Serafeim & Gombos, 2015). With this neutralization technique, people claim that it is senseless to be morally critical of what they are doing. Behavior can be seen as a natural phenomenon, similar to a gushing storm, a tsunami, or a fight among animals. In the Iceland study, Nordal and I found that bankers who came under criticism for their behavior leading up to the collapse of the banks compared their working conditions to being out in a boat during a storm, when people will instinctively do whatever they can to survive. Forces beyond their control dictated the events (Kvalnes & Nordal, 2018). Even in this material, some decision-makers excused their own behavior by claiming that they had only been following orders from their leaders. Leaders who defend lying in reference situations do not appeal to natural forces but more to necessity and business logic. It is what everybody in a competitive market would do, so it makes little sense to point a blaming finger at them or hold them morally responsible (Kvalnes, 2014b). With this neutralization technique, the decision-maker attempts to minimize or deny the fact that the act in question will create any harm. An individual can claim that whether he or she buys that particular smartphone will not make a discernible difference to anyone. The impact of that small and isolated act is minimal. One particular act’s negative consequences can be spread so thinly onto a very large number of people that it makes little sense to talk of causal infliction of injury. In moral philosophy, Parfit (1984) discussed the prevalence of denial of injury justifications at length. He claims that people are morally responsible for the sum of the negative consequences they bring about, even when those consequences are individually imperceptible to those affected by people’s conduct. A driver may argue that the negative consequences of the pollution coming from his or her car are spread very thinly over a large number of people. No one will notice a positive change if this particular car user decides to walk or use a bike to work instead of driving. Thus, the car user may argue it is pointless from a pollution perspective for him or her to quit driving. A similar argument can be made by someone who buys a smartphone containing lithium batteries made with dubiously mined cobalt. If he or she decides not to purchase such a phone, it will not make a discernible difference to any particular individuals, so refraining is pointless. Parfit (1984) challenges this line of thinking and argues that people are responsible for the sum of their actions’ negative consequences irrespective of whether they are thinly or heavily distributed to other people. An individual can cause a considerable amount of injury, even in cases in which no one will notice that he or she stops performing the actions that have caused such injury. When using this neutralization technique, the decision-maker can acknowledge that his or her actions will have some negative impact but claim that the injured party does not deserve moral protection. Those affected have only themselves to blame. Either they were the ones who started it or they engage in similar conduct themselves or would have done the same if they had been in a position to do so. Employees who experience poor treatment from their employers often employ this technique when they convince themselves that they are not really being immoral when they act against the employer’s interest; rather, they are restoring justice (Hollinger & Clark, 1983). Ariely (2012) has identified a similar phenomenon when informants who participate in experiments are deliberately treated with some degree of disrespect. When they get a chance to cheat, they do so and seem to think that they are entitled to do it to restore moral balance and order. In the study of lying in reference situations, this argument proved to be prevalent. Participants argued that any representative of a competitive company would do his or her best to offload a quarrelsome employee and therefore would be ready to lie about the person’s social abilities. The excuse for doing so was the assumption that he or she would have done the same and thus is not a victim—and does not deserve moral protection (Kvalnes, 2014b). Even with denial of victim, Parfit’s (1984) argument regarding distribution of negative consequences is relevant. It is tempting to say that because nobody will notice that one quits driving, refrains from buying a smartphone, or more generally stops performing some other action that has negative consequences that are imperceptible to the individuals experiencing them, there can be no real victim. In Parfit’s line of thinking, there can be numerous victims, even if none of them will notice when someone decides to leave a car in the garage or refuse to buy a new smartphone. In Kvalnes (2014b), I used one of Parfit’s (1984) examples to illustrate the combination of the techniques of denial of injury and denial of victim: In the bad old days, each of a thousand torturers inflicted severe pain on one particular victim. If one of them stopped, one particular victim would experience a complete freedom from pain. In the vocabulary of this chapter, each of the torturers had to live with moral dissonance, the discrepancy between a general moral belief that one should not inflict pain on others and their professional, everyday duties. Parfit (1984) proceeded to describe what can be called the “good new days,” in which the setup is designed to eliminate moral dissonance for torturers. They are still one thousand in number, and they have one thousand victims. Each torturer now presses a button, thereby turning a switch once on each of a thousand torture instruments attached to the thousand victims. If every torturer does his or her job properly, then each of the victims suffers the same severe pain as the victims in the “bad old days,” even as none of the torturers makes any victim’s pain perceptibly worse. Each of them can claim with credibility that it would make no perceptible difference to any victim if he or she suddenly refrained from pressing the button. Each can therefore deny that he or she is causing injury and has a victim. Parfit (1984) argued against this line of thinking, claiming that the modern torturers are no less culpable or responsible for causing pain than their predecessors. The new setup is admittedly more sophisticated, but each torturer is responsible for the total amount of pain generated by his or her behavior, irrespective of how it is distributed among victims (Parfit, 1984, p. 80). This neutralization technique consists of criticizing one’s critics with the argument that they fail to understand the dynamics of a particular social practice. The rationale from the decision-maker’s perspective is that “by attacking others, the wrongfulness of his own behavior is more easily repressed or lost to view” (Sykes & Matza, 1957, p. 668). The decision-maker can also raise doubts about the condemners’ motives for expressing moral condemnation in the first place. Moral concerns thus deflect back onto the condemners. They are the ones with a dubious ideological or moral agenda. This technique can be employed when one faces real critics or an imaginary foil. Iceland’s banking sector had some critical voices in the time leading up to the crisis, but they were silenced or chose to quit their jobs. Their motivation and understanding of the situation was put in doubt, in line with the condemnation of condemners technique (Kvalnes & Nordal, 2018). This is a neutralization technique in which the decision-maker denies that self-interest motivates the decision or act. He or she instead claims to be honoring some other important moral obligation. In business, it can typically be loyalty to one’s company, colleagues, employer or employees, or the shareholders. The decision-maker considers them more important in the current context than honesty, fairness, or other moral values. Leaders who are willing to lie in a reference situation typically argue that they owe it to their employer to make sure the difficult employee disappears from the organization (Kvalnes, 2014b). Icelandic bankers claimed that their motivation for engaging in hazardous transactions was to save the organization from bankruptcy (Kvalnes & Nordal, 2018). Waste management employees who offered industrial clients cheap and unsustainable ways to get rid of hazardous waste argued that it generated good business for their employer (Kvalnes, 2017; Serafeim & Gombos, 2015). In their initial study, Sykes and Matza (1957) identified five neutralization techniques. Other researchers have added to the list. Heath (2008) suggested two more techniques that he thinks are not captured properly by the initial list, calling them “claims of entitlement” and “everyone else is doing it.” In the Iceland study, Nordal and I found that many decision-makers neutralized their dissonance by finding ways around existing rules and regulations (Kvalnes & Nordal, 2018). We named this technique the “claim of having breached no rules” and tied it to the concept of loophole ethics discussed in Chap. 10 of this book. Another phenomenon that can be linked to neutralization is that of moral licensing, which occurs when past good deeds liberate people to misbehave, on the assumption that the behaviors balance each other out (Merritt, Effron, & Monin, 2010; Shalvi, Gino, Barkan, & Ayal, 2015). With each suggested addition to the list of neutralization techniques, it is relevant to question whether it overlaps with one or more techniques on the original list. Kaptein and van Helvoort (2018) have delivered the most comprehensive and systematic suggestion for categorizing neutralization techniques to date. They distinguish between four main categories (distorting the facts, negating the norm, blaming the circumstances, and hiding behind oneself) and have operationalized each of them into three techniques, each of which consists of four subtechniques. The present discussion does not rely on a precise demarcation of the available techniques of moral neutralization. Here it suffices to establish that decision-makers in organizations can overcome initial moral dissonance by engaging in moral neutralization, an activity that can explain the emergence of morally questionable and unacceptable behavior in the workplace. The process in question is different from rationalization because it occurs prior to the action. Ex ante moral neutralization is the cognitive process that lowers the threshold for misbehavior, allowing the person to act against his or her original moral convictions, and ex post rationalization is the person’s later attempt to justify the decision to act that way. Sometimes, data about rationalizations can serve as indicators of initial neutralization. In the Iceland study, Nordal and I depended in part on interview material from the time after the financial crisis to reconstruct the neutralizations that most likely enabled people in the financial sector to go beyond moral dissonance in the first place (Kvalnes & Nordal, 2018). The concept of moral neutralization can help explain how morally upright people in organizations can overcome moral dissonance and end up acting against their initial moral convictions. Ariely (2012) has a name for what happens when the original moral misgivings concerning a particular option disappear: the what-the-hell-effect. Once the moral resistance is gone, the road lies open for new routines and practices. The concept is an adaptation of one originally used in research about eating to describe people who succumb to temptations to violate a particular diet (Baumeister & Heatherton, 1996; Polvy & Herman, 1985). One violation leads to further ones as it changes the baseline for what one can do. It is not known whether Hamilton and his teammates ever experienced significant moral dissonance before engaging in doping. In this quote, any traces of moral doubt about competing under the influence of illegal performance-enhancing drugs have disappeared. Hamilton and the others felt that is was fair to break the rules. This chapter showed that those in organizations who are responsible for (and concerned about) ethics should take heed of how (1) moral dissonance can disappear through processes of (2) moral neutralization, which can pave the way for a (3) normalization of questionable behavior. People can be familiar with the Navigation Wheel and the whole array of ethical theories, principles, and concepts and still be vulnerable to developments of this kind. Excellent analytical skills do not offer sufficient protection against becoming involved in neutralization processes. Maybe some individuals of firm and stable character are better equipped to resist invitations to use moral neutralization techniques than others. In an organization, the main countermeasure against the development from (1) through (2) to (3) is encouraging people to speak up and confront colleagues who appear to be engaged in moral neutralization. To be the one providing resistance to a leader or a colleague’s neutralization attempts takes courage and can be unpleasant. In many instances, people will interpret it as an unwanted disruption of a process that is in flow. Why spoil the path toward higher profits and better margins for the organization? When a person has been brave enough to voice his or her moral concerns in such a context, all eyes will be on that person for some time. Colleagues will be eager to see what happens next in that person’s career. Was it a wise move or one that the person receives punishment for in the form of remaining on the same step on the career ladder or having to take steps down? The answer exposes the organization’s communication climate for stopping moral neutralization in its tracks. The next and final chapter of this book discusses more broadly the organizational climate for addressing and discussing ethical issues at work.